Home|River Resources|What Is A Watershed? All of us live in a watershed! A watershed is any area (both above ground and below) that drains to a particular water body—such as the Connecticut River. 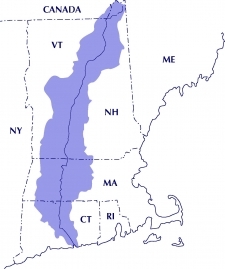 The Connecticut River watershed is more than 11,000 square miles and includes portions of four states: NH, VT, MA & CT. CLICK HERE for fun facts about the Connecticut River and its watershed. A watershed can be a difficult thing to understand. Check out these two short videos that will help you get it. Then, learn what you can do to help protect the Connecticut River watershed!